Welcome to those of you who have chosen to subscribe to our blog! Your interest is appreciated. Our new issue has just been printed and is in the mail to subscribers. The digital version will also soon be available. We look forward to your feedback. We’d also like to know what you’d like to see on our website to enhance your experience. Send us an email or use Facebook for your comments to I Read On Spec. Also, the Patreon campaign continues, and we will need your support to get through the coming year. Every dollar counts toward the goal of sustaining On Spec. This is an update to our most recent fiction submission period. Some of you have been asking (and rightly so) about the status of your stories. While you can log in to Submittable and see the latest information, including editor comments on declined stories, you were promised a response by the end of November. In a perfect world, that would be so. We accepted submissions of stories for our regular issues as well as for the upcoming theme issue of “punk” stories. With the few resources we have, we chose to concentrate on the punk submissions first, and so those ones have been selected. We will now move on to read the submissions in the other batch of manuscripts we received. Each story can take 20 minutes to half an hour of an editor’s time, just for the first reading. And we have approximately 200 stories to read. That’s a lot of person-hours. So we appreciate your patience as we move through this long process. As 2014 comes to an end, it is time to reflect on the highs and lows of the past year, and to look ahead to a fresh year, with so many possibilities. I’m pleased to report that we have achieved some form of financial stability in spite of the drastic cut to our 2015 grant funding, and we are grateful to those sustaining patrons who sent us money, and to those who continue to donate. With careful management, we can get through the coming year. And remember how easy it is to donate through Patreon and show your support. We want to continue to bring our readers even more challenging and interesting fiction, art and poetry, and to show the world that Canadian writers thrive. Speaking of the world, please support us by subscribing to the digital version of On Spec, and do let your friends and family in countries outside Canada know just how easy it is to be reading On Spec within a few seconds. In the coming months, we’ll be making further enhancements to the website, and adding new and engaging content. If you are interested in volunteering for On Spec, we hope to have a new database set up, so prospective volunteers can send us their information, and we can put them to good use. We will also be looking at new stories to develop for the On Spec Teacher Toolkit Series. If you know a teacher, let them know about our comprehensive teaching aid for “Space Monkeys”, a story that appeared on the pages of On Spec. Other projects will be announced as the year progresses. We’ll be at several conventions and book events in the coming months, and as always, we look forward to meeting with our authors, artists and readers. 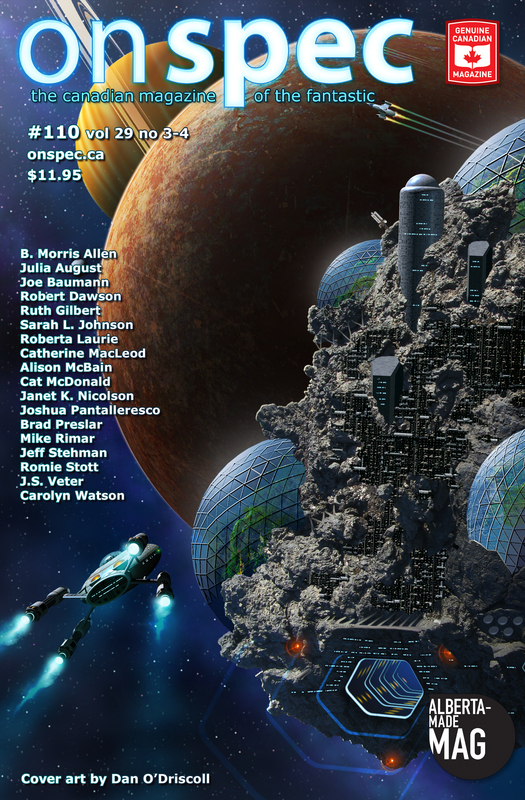 Also be sure to look for our friends and colleagues with Tyche Books, and buy a copy of the On Spec 25 year anthology. My deepest thanks to all my On Spec family–editors, staff, proofreaders, designers– and to all the creative artists who have placed their work in our hands over the years. I wish you all success and good fortune in the coming year. The editors and staff of On Spec are gratified by the show of encouragement from our readers and friends in the months since we learned of our current financial difficulties. The good news is that, for now, we are on an even keel, and we’ve been able to reduce spending and increase savings in a few strategic areas, without sacrificing the quality of our magazine or its contents. On Spec will continue to publish. Grants are never assured, and we have been fortunate until now. But grants are not enough. It’s the ongoing support of our readers that keeps us going. So at this time of the year, when you are looking at your holiday shopping list, please consider a gift of a subscription to On Spec for the readers in your family or in your circle of friends. You can buy a paper subscription, or a digital one, and it really is a gift that continues to give pleasure to everyone who reads it. Monthly contributions to our Patreon sustainability campaign will always be most welcome. On Spec editor, Susan MacGregor has graciously published our status update and call to action in her Suzenyms blog (one which you should bookmark for sure). Please read it. We appreciate your support. On Spec call to action after grant funding denied. On Spec – Brave new blog! On Spec is trying something new – stay tuned!